CNN has taken its “Facts First” branding to a new level — in the form of a fact checking sidebar. During the first White House press briefing in nearly a month, CBS News‘ Steven Portnoy quizzed press secretary Sarah Sanders about the Trump administration’s rejection of a key climate change report. 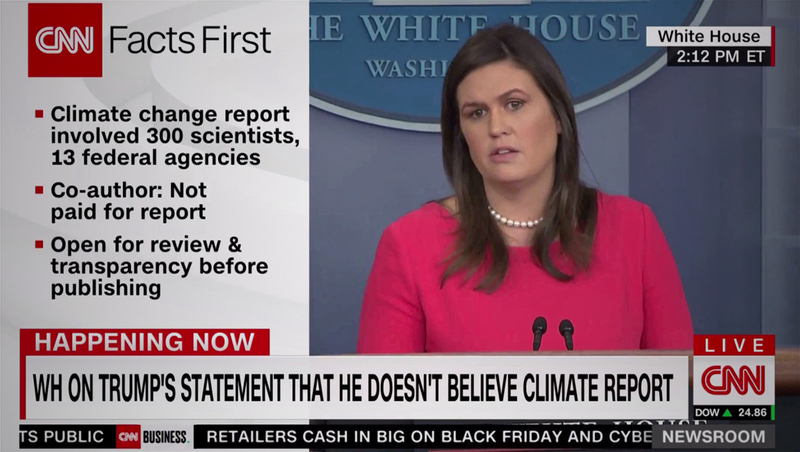 During Sanders’ response, which centered around what she called the administration’s focus on ensuring America has the “cleanest air and cleanest water” and, ironically, calling the report “not data driven,” CNN “pushed” her image aside for a bullet list. The list featured the CNN logo and a large “Facts First” heading followed by three points about the report’s background. Notably, the points listed in the sidebar did not necessarily directly address Sanders’ response, indicating it could have be pre-prepared. However, the effect of having a prominent graphic sporting the word “facts” next to Sanders does have a dramatic effect — if only to attempt call out the fact that the information being spoken isn’t, well, factual.